What answer best describes Spanish attitudes towards de las Casas’ report? Many Spaniards were horrified by the savage and cruel behavior he described. Most Spaniards discounted his description because it was Protestant propaganda. Most Spaniards were incredulous because they realized de las Casas intentionally distorted precise colonial census information. Generally, Spaniards were unconcerned because they thought Native Americans should be exploited because they were uncivilized. The correct answer is (D). Spanish officials thought Native Americans were inferior people who should labor on plantations, in mines, and other economic endeavors in order to enrich Spain. Which of the following answers correctly identifies an important consequence of the Spanish attitude towards Native Americans? Because so many native peoples were dying, the Spanish began to import slaves from Africa to replenish their labor supply. Native American people and culture were completely eradicated. The Spanish crown became insolvent because the reduced labor supply made it impossible for colonial possessions to become profitable. Many Spaniards, driven by a sense of Christian piety, urged the crown to create reforms that resulted in an increased standard of living for Native Americans. The correct answer is (A). As Native populations succumbed to disease and warfare resulting from European colonization, imperial powers turned towards African slaves in order to maintain productivity in colonial economic enterprises. Which of the following answers correctly describes the social hierarchy of the Spanish empire? Social standing was based on merit and abilities – anyone could increase their status and rise to the top. Spanish officials created a strict caste based on precise racial categories that placed native Spaniards at the top. Only colonists of pure Spanish heritage were accorded any social status. No discernible rules governed colonial society – the status of each colonial subject was randomly determined. The correct answer is (B). The Spanish empire was based on a precise ranking which defined social status based on race. Settlers from Spain had the highest status, followed by Spanish subjects born in the colonies, then persons of bi-racial heritage, followed by indigenous peoples, and finally Africans were at the bottom. 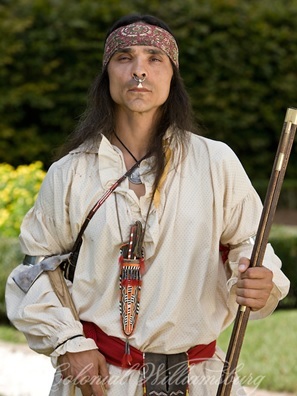 Questions 4–5 refer to this image of an actor portraying a Native American of the early colonial period. The image highlights which of the following? The uniquely war-like attitude of Native Americans. The civilizing effect of European colonization upon the Native American peoples, which was entirely beneficial. How Native Americans became dependent on European trade goods. The lack of reciprocal influence Native Americans had on European colonizers. The correct answer is (C). Metal tools and weapons were highly sought-after trade goods which Native Americans could not produce themselves. The Native Americans entered into a cycle of dependence by bartering with European traders. Which statement best describes the relationship between Native Americans and European settlers? Native Americans unanimously welcomed the colonists because they understood the settlers were superior in many ways. Native Americans and Europeans at times traded peacefully with European colonists but also frequently used diplomacy and force to resist encroachment on their territory, political sovereignty, and way of life. Native Americans were skilled warriors who incessantly resisted European settlement and were only defeated by the colonist’s superior technology. Europeans had very little contact with the Native Americans because they thought indigenous peoples would corrupt settlers with their uncivilized way of life. The correct answer is (B). The Native Americans and European settlers frequently misunderstood each other which often led to violence. At the same time, extensive contact occurred between both groups which led to changes in both cultures. Which of the following statements correctly describes the consequences of European colonization? The effects of colonization up both Europeans and Native Americans were temporary and very small. The Europeans helped civilize the Native Americans and improved their quality of life by sharing technology with them. Both the Europeans and Native Americans became rich and powerful by sharing the profits from economic ventures. Colonization brought wealth to European imperial powers which resulted in political and economic innovations. The correct answer is (D). Imperial powers used the silver from the Potosi mines (pictured above) to fund their attempts to expand their power in continental Europe. Economic innovations like joint stock companies emerged and capitalism began to replace feudalism. What enabled the Europeans to conquer the Native American peoples? There were no powerful Native American empires — only weak bands of nomads. The European invaders greatly outnumbered the Native Americans they encountered. The Europeans had advanced military technology and also brought with them diseases which ravaged native populations. The Native Americans were subdued because they were pagans and refused to accept Christianity. The correct answer is (C). Europeans had metal armor, weapons, and horses but Native Americans had none of these. In addition, small pox, measles, and other diseases killed millions of natives who lacked immunity. What effect, if any, did Native American culture have on Europeans? Nothing — the Europeans rejected every aspect of Native American culture because they thought indigenous peoples were uncivilized. Many Europeans began to worship Native American deities because they were disgusted with the conflicts created by the Reformation. Large numbers of Europeans began to dress like the Native Americans because it was much more comfortable. Europeans began to partake of many of the same luxury items that the indigenous social elites consumed. The correct answer is (D). Europeans learned to smoke tobacco, drink chocolate, and consumed other foodstuffs which were found only in the New World. Question 9 refers to the following passage from Girolamo Benzoni, an Italian observer, who traveled to Hispaniola in the mid-16th century. Which of the following statements correctly describes Benzoni’s account? It is totally incorrect because there was no gold in the New World at all — it was all a rumor. It is completely correct because Native Americans were Satanists. It is partially correct because Benzoni accurately describes the animistic elements of indigenous religions and the syncretic results of missionary work. It is partially incorrect because Native Americans always completely abandoned their traditional beliefs after converting to Catholicism. The correct answer is (C). The passage is rife with bias but it does contain some truth when it describes the various animals the indigenous people worship. Many Native American people also blended animism and Catholicism into a new belief. Refer to the mid-sixteenth century tapestry below to answer question 10. Which of the following statements most accurately describes the encounter between the conquistador Hernán Cortés and the Aztec leader Moctezuma as depicted above? Cortés, who is only accompanied by a woman, is weaker because Moctezuma has several soldiers with him. Cortés and Moctezuma are equals because they are both pointing at each other which indicates reciprocity. The tapestry recognizes the important role indigenous women played as translators and cultural mediators between Europeans and Native Americans. Moctezuma is accepting Cortés’ offer to marry his sister, who is dressed in traditional Aztec garb in order to signify she has joined the indigenous royal family. The correct answer is (C). Malinche, who appears on the right side of the tapestry, was an example of the role women often played as go-betweens in colonial encounters. Refer to this image of Serpent Mound to answer question 11. Which answer best describes the lives of Native Americans immediately preceding the moment of European contact? Native peoples created different types of settlements, engaged in long-distance trade, practiced religion, and supported social hierarchies. Native peoples were totally uncivilized and lived in small nomadic groups that wandered from place to place in order to survive. Native peoples lived in highly advanced societies that included metal-working, written languages, and numerous large cities. All native peoples were egalitarian because they only organized themselves into groups of hunter-gatherers. The correct answer is (A). Native Americans created a wide array of lifestyles which varied according to the local geography and climate. They had some permanent settlements but lacked written languages and the ability to create metal tools or weapons. Question 12 refers to the image below — a 16th century image that portrays the impact of smallpox on the Aztec population. Why did the Native American people lack immunity to European diseases? Unlike Europeans, indigenous peoples had not developed vaccines. Most Indigenous peoples did not live in urban areas and had few domesticated animals, which meant they did not develop a resistance to many animal-borne illnesses. Indigenous peoples were physically inferior to Europeans and often became ill.
Indigenous peoples died because they suffered divine retribution for refusing to convert to Christianity. The correct answer is (B). Close proximity to animals and the presence of large cities facilitated the spread of numerous epidemics, such as the Black Death, in Europe over centuries. These factors were not present in the New World and made the Native Americans especially vulnerable to deadly diseases including smallpox.